Vijay Mallya has been talking about his feelings regarding the progress of Force India this year. He is both happy and dissatisfied, believing that the team has progressed remarkably since last year and yet is still to score its first point in the championship. Looking at the team from the outside, it has to be said that they are much improved from the beginning of the year and it is only bad luck that has prevented them scoring to date. The last few races have seen them contending with Honda and occasionally beating them - no small achievement when it is remembered that the Japanese team has a budget many times larger than Force India's. We should also take into account that they use Ferrari engines, however. The stories of Ferrari enjoying a considerable power advantage over other engines, apparently demonstrated by speed trap times in the Valencia GP, must cast some doubt over the extent of Force India's progress. Certainly, it would be unfair to expect that their car should be equalling the times of other Ferrari-engined cars, given that the chassis is not as finely developed as others, but that extra power may comprise at least some of the improvement that has made them Honda competitors. For this reason alone, I doubt recent rumors of a possible change in engine supplier for Force India. Unless the alternative engine were much cheaper, I cannot see Vijay throwing away whatever power advantage the present engine gives the team. His goal remains to stay in F1 and eventually succeed, regardless of stories that he has been surprised at just how expensive the game is, and a change to a less powerful engine for cost reasons would be an admission of failure at a very early stage. In terms of race performances, Force India have had their moments of glory (Sutil at Monaco, for instance), interspersed with awful luck (again, poor Adrian's demise at Monaco while heading for points) and disappointment. Their race at Spa was another mixed bag, with Fisichella touring around in last spot whilst being assaulted by almost every driver on the track, it seemed. But Adrian Sutil put in a creditable effort, particularly during the wet parts of the race. In the damp early laps he went from 18th on the grid to 16th, passing Button and Coulthard on the way. Once the track had dried, he fell back down the order but then spent most of the race in 16th. When the rain came at the end, he stayed on dries and fought his way past Button (again) and Nakajima to claim 13th at the line. Not hugely impressive, we might think, but take a look at the list of fastest race laps. 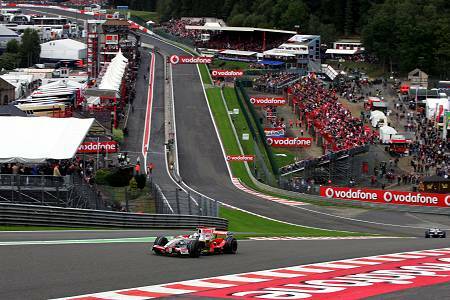 Adrian was the 13th quickest driver around Spa that day, beating both Hondas and Williams, a Renault and a Toyota in the process. Accepting that Trulli's car had been damaged on the first lap, that is still no mean list of cars for the Force India to beat. It has nothing to do with Sutil's known skills in the wet too - his time was set on lap 27 when the track was bone dry. That has to be a hopeful indicator to the team that they are improving even beyond Honda, in race times at least. If their luck changes, it seems quite likely that they will achieve Mallya's goal of a point this season, especially as there are a few GPs coming up where the weather can be very wet on occasion. So I think Force India should be encouraged by their year and get over whatever internal squabbles that the rumor machine is suggesting are present. For a team that was in disarray when it was bought, Force India are doing probably better than anyone expected and we can hope that they will continue to stand alongside Williams as a surviving member of the independent brigade. ok, everyone else must be working harder than me today- i'll say it- hallelujah someone's talking about one of the teams nobody else is talking about. i was hoping for a bit more from force india but, probably a bit too optimistic of me. i'd just like to see 6 teams in contention for the championship some day. Hear, hear, Vera - the more teams in with a chance of lifting trophies, the better for F1. It may be a few years before Force India become genuine contenders for any silverware but it is my fervent hope that they do so. While they don't have the scrappy, happy-go-lucky rep that Super Good Friends had, I think they are are a credit to the sport. Let's hope their owner doesn't get too cost conscious and fall back into their Midland iteration.